Professor Eben N. Horsford a Harvard Professor of Chemistry. So beware of men bearing impressive credentials that they do not, by power of a prestigious brand name. steal reason and twist knowledge to their purpose. Horsford was also the principal patron to fund the Leif Erickson memorial sculpture that decorates Commonwealth Avenue at Charlesgate East. 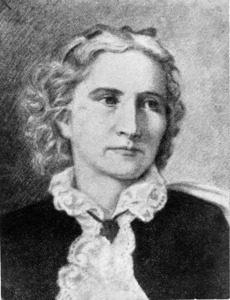 Professor Horsford made a fortune from reformulating baking powder with calcium biphosphate rather than cream of tartar. Fortunately, Professor Horsford’s attempt to “reformulate” history was not as successful as his chemical profundity. The theory that Leif landed in North America and founded a settlement called Norumbega, along the Charles River was a particularly nasty brand of Nordic / Aryan race superiority cooked up by a certain bunch of Boston Brahmins who were intimidated by the immigration of Irish and Italians into their territory in the late nineteenth century. 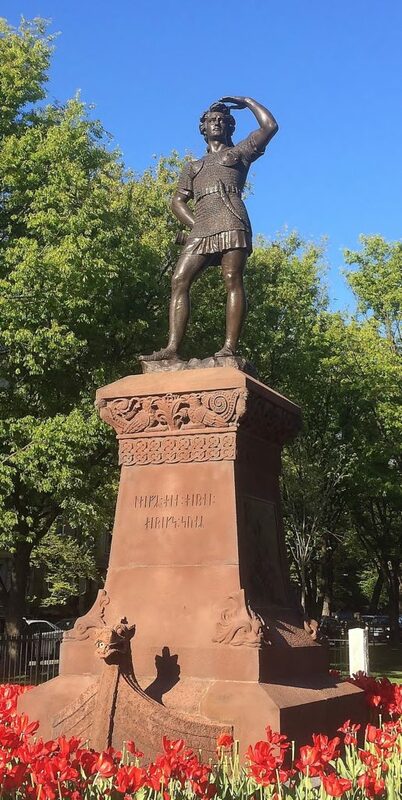 It was the intent of Horsford and his ilk to debunk the accepted history with “alternative facts” proposing the idea that an “Aryan”, not a Mediterranean Catholic discovered North America. In Horsford’s defense, it should be noted that he was an early supporter of women’s education and benefactor of Wellesley College. 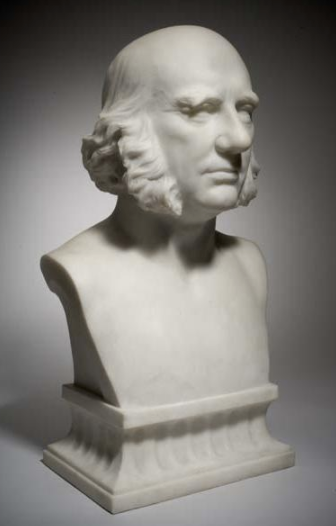 Presumably, his support of women is also why Ann Whitney was awarded the commission to sculpt Leif. This is my guess without documentation but I think it is a safe bet. 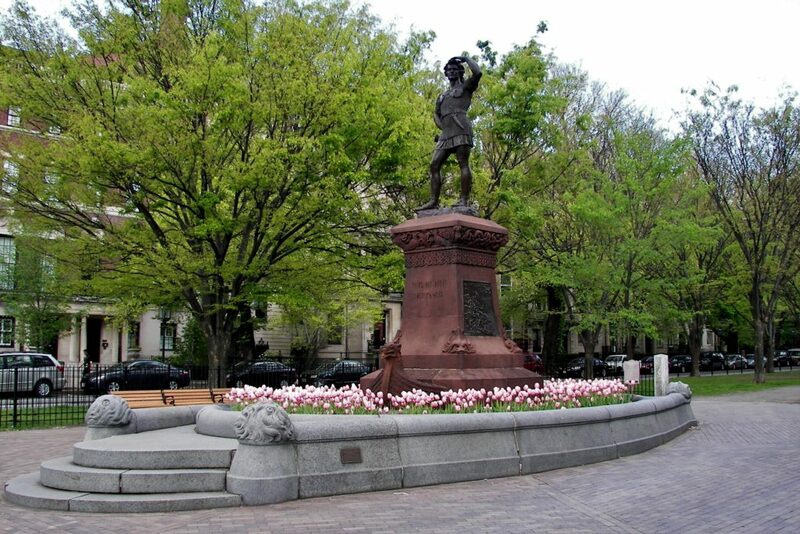 The Leif Erikson monument consists of an over life-size bronze statue of the explorer by the sculptor, Ann Whitney (1887). 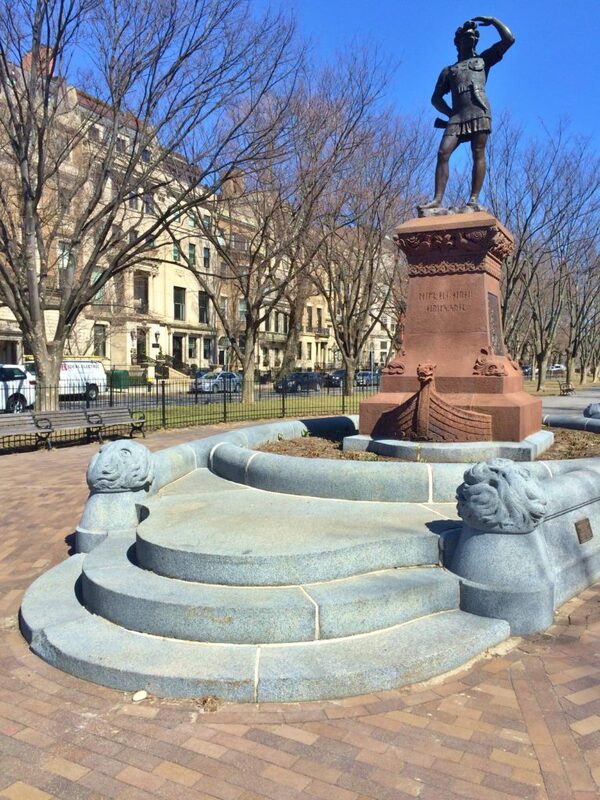 He stands on a brownstone plinth that terminates at its base with a curving prow and stern of a Viking long boat. 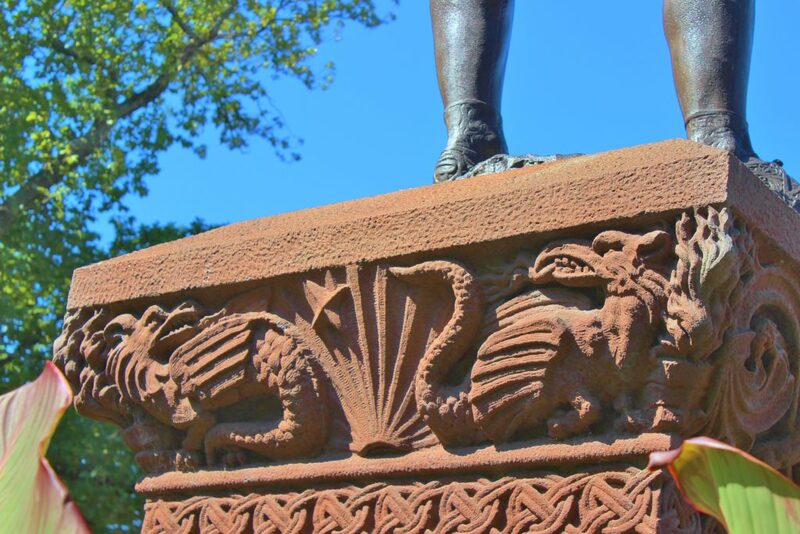 The prow, in the form of a dragon, was intended to be a fountain head spouting water into a granite basin that surrounds the monument and is roughly shaped like a boat with four curious granite finials. Today the basin is filled in with earth and planted with seasonal flower displays. 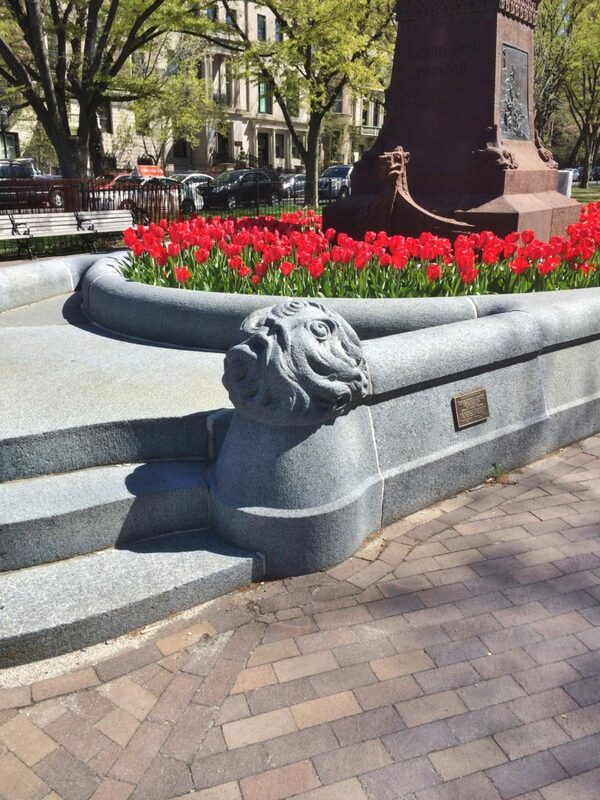 There are also two bronze plaques on the right and left sides of the supporting plinth. 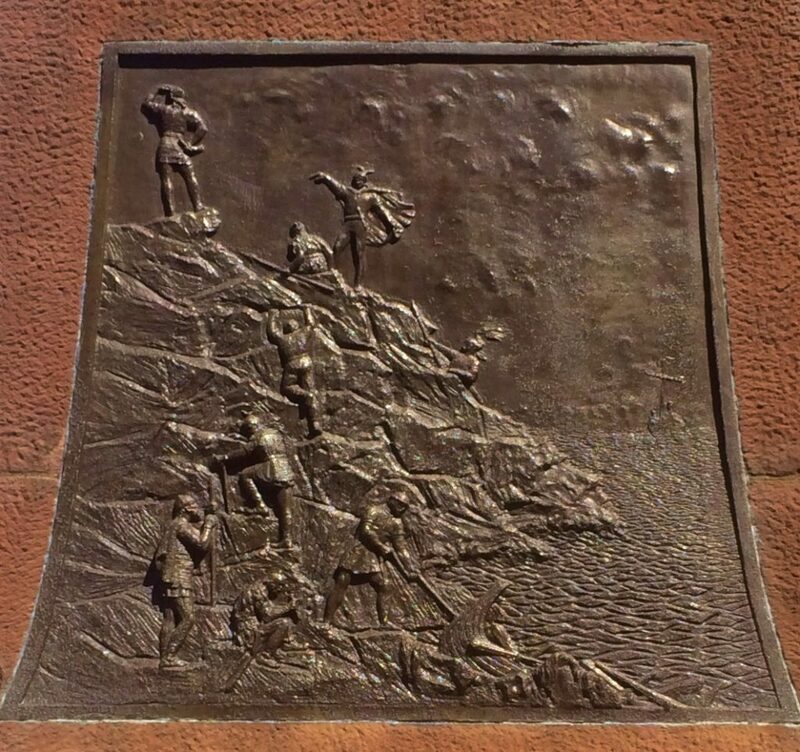 In the right plaque we see Leif and his crew landing on a rocky promontory, mooring their long boat and scrambling up the precipice where Leif has already gained ascendancy. He stands with hand shielding the brilliant dawn of a new era with a penetrating gaze inspecting the new land. 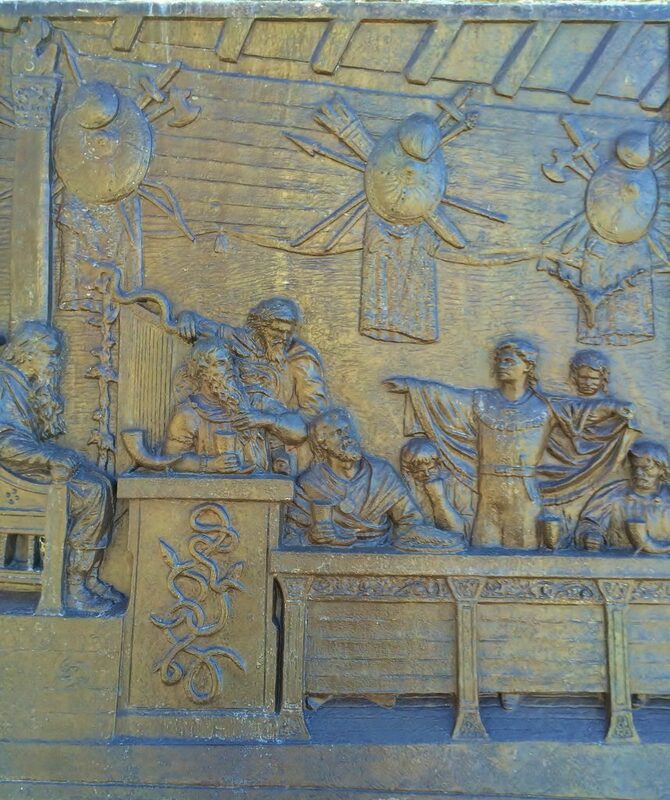 The second plaque depicts Leif and his crew, presumably back home, reporting to the elder Vikings their discoveries. This scene takes place in a Viking long hall decorated with trophies of weapons: swords, shields, a sheath full of arrows and helmets. 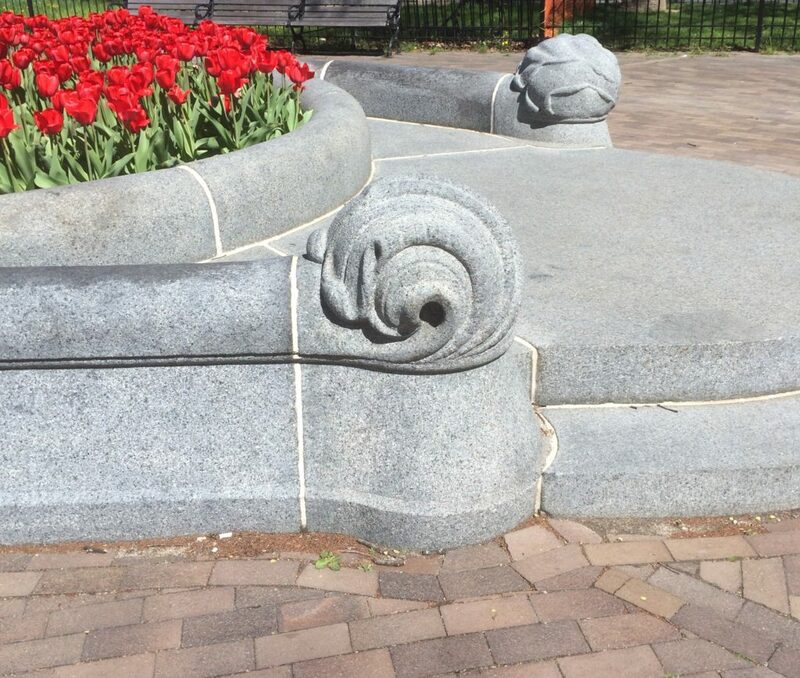 In the same vein of mystery are four granite finials that mark the termination of the water basin surrounding the monument. Each of these creatures is unique. 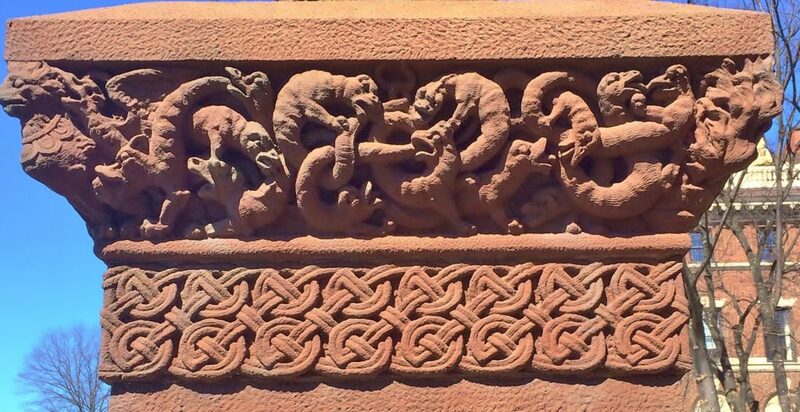 The front left is a zoomorphic head with a threatening beak (octopus, giant squid, sea bird?) 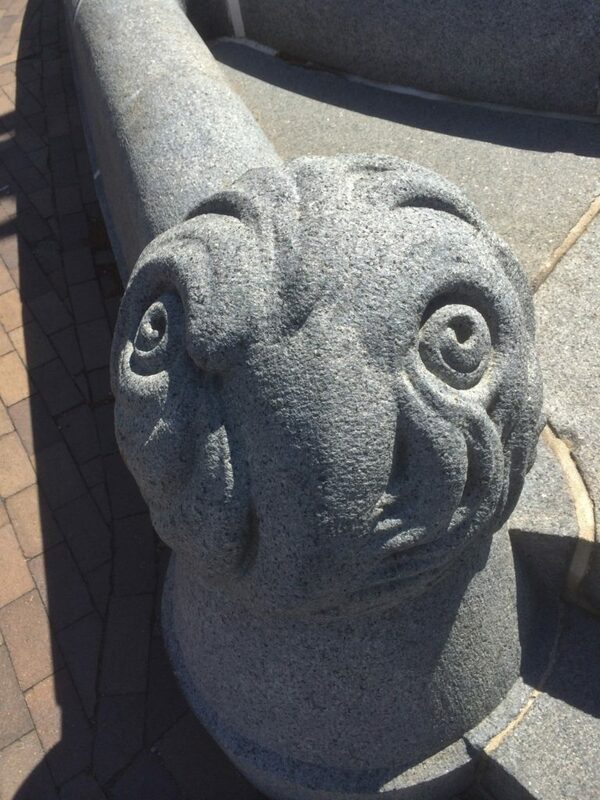 between two “eyes” of tightly coiled spirals that stare up at the viewer with menace. The rear two finials resemble seaweed vegetation being curled into graceful balls by invisible ocean currents. These four granite sculptures are in marked contrast, both in texture and color, to the dominant vertical brownstone plinth and as such form a foundation of mystic forces representing the perils ever present in the wilderness, especially the unfathomable ocean. At the top of the supporting plinth are two bands of decoration. The top-most band is different on all four sides but the lower band is uniform all around, depicting two rows of a Viking / Nordic knot design. 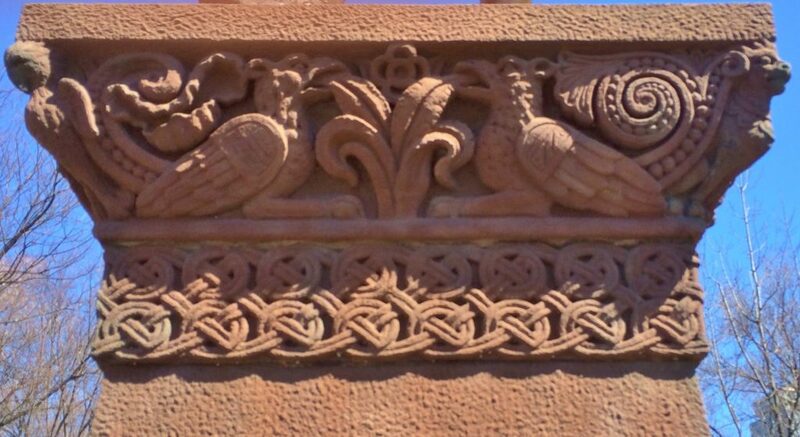 On the top-most band starting in the front of the monument, there are two birds whose wings are shaped like shields. Their tails curl up with rows of beading terminating in tight spirals,. On the view’s right a flourish of tail feathers drapes over the bird. On the viewer’s left, a wrinkled leaf fills the space. At the center of this band the dominant birds face each other, each with a leaf of the central flowering plant in their resspective beaks.The flaring corners of this band are protected by strange creatures half bird and half lion, each one different and distinct. Going round to the viewers left, the top band of decoration is composed entirely of a group of writhing animals in high relief sculpture. These strange creatures have a peculiar larval anatomy somewhat between a caterpillar and a salamander. 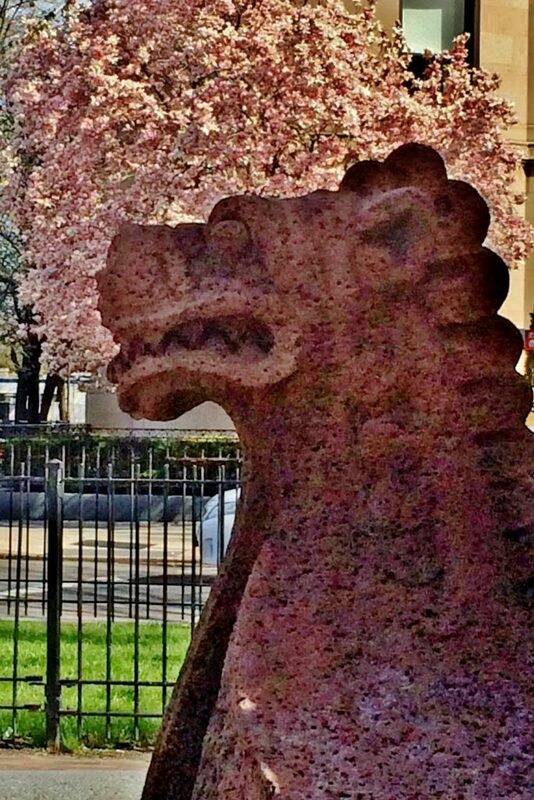 The topmost band of decoration at the back of the plinth reveals two winged dragons with scaly tails and griffin heads turned back to center and glaring at each other breathing fire. They flank a radiating fan (rising / setting sun?) with a four pointed star (morning / evening star?) suspended within the spokes of this fan. This decorative band terminates at the corners with flames rising from a mysterious vessel or is this intended as a log fire? 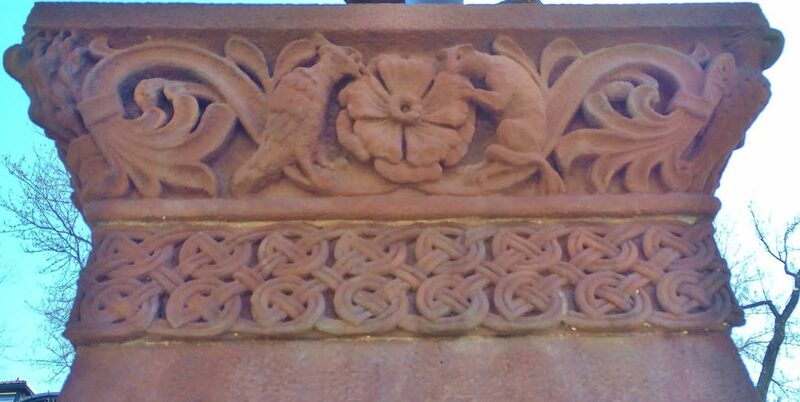 The right hand band at the top of the plinth shows what may be a woodpecker and a squirrel facing each other and feeding on a flower that has two rows of five petals each. This flowering plant in the center spreads scrolling branches of leaves terminating in flourishes of anthemion or palmette. I suspect that the plinth and fountain basin were the work of another designer, not Ms. Whitney. The eclectic “Nordic” design motifs employed are inventive and perhaps include disguised esoteric meaning. I wish I could discover the actual collaborative designer and read about the full intent of that artist. It could well be that the bronze plaques on the sides of the plinth are by Ms. Whitney but I don’t know that as a fact, they are not visibly signed. The extent and complexity of the overall design is interesting and remarkable. Without being fussy or overdone, the ensemble stands together to make a handsome if fanciful exposition in historicity. 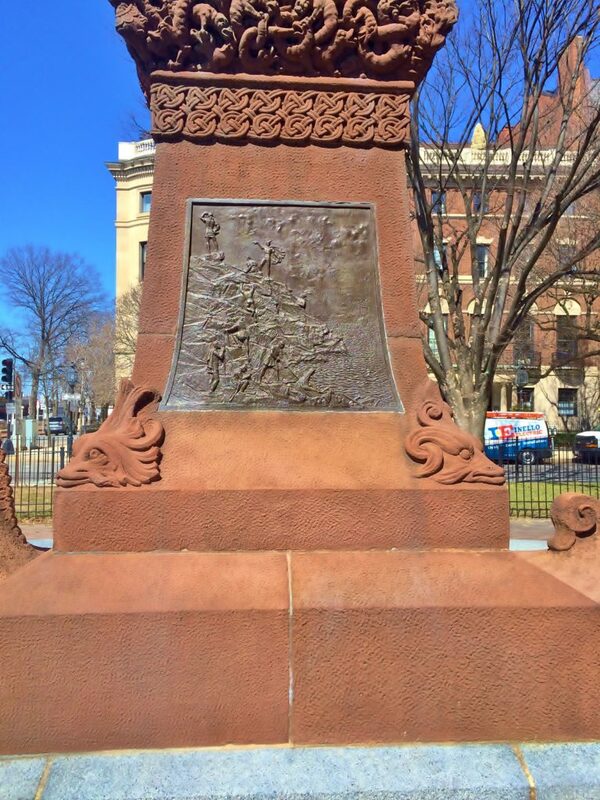 This entry was posted in Leif Erikson Monument, Stones of Boston on May 9, 2017 by ioryallison3.